This week was gorgeous weather having temperatures in the mid- to upper 70’s most days with very little rain and light winds. We even had some cloud cover on most days making it very comfortable fishing. And as for the fishing it was simply fabulous as you will read about below. In 1997 Dave Hamilton and Al Sins coming from Maryland made their first visit to Fireside Lodge, and 20 years later coming from Raleigh and Asheville, NC they arrived making their 18th trip to Fireside Lodge with the same excitement in their eyes. These two love to search for our BIG Muskie and the 1st day that’s just what they did getting some follows and catching a few Northern Pike. 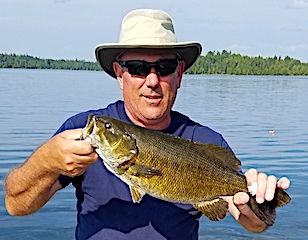 Second day they went for numbers catching all the Northern Pike they wanted and in the evening after supper had an absolute blast catching Big Smallmouth Bass with surface poppers with Dave landing an 18-inch Master Anglers Award Trophy Smallmouth Bass. 3rd day they got back to what they love to do, Muskie Hunting and they were very successful catching 5 Muskie total and having numerous other follows. Al had the hot hand catching 4 of the 5 and the largest being a Trophy at 44-inches. This fish came after Dave had it follow his lure twice then Al through back to it and it slammed his Tommy Gumper. This is simply a Mepps Spinner with no hair, which resembles their good friend Tommy Gumper. Next day they caught some Pike & Smallmouth plus had some Muskie follows. 5th day was a Super Day catching 5 Muskie along with having many follows. 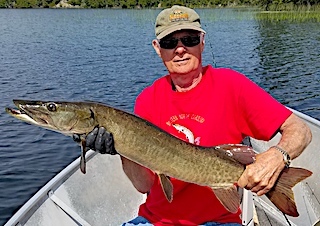 Dave caught the largest Muskie at 37-inches plus he caught two Trophy Smallmouth Bass 19.5-inches and a 19-incher and Al caught one at 18-inches and a Muskie measuring 35-inches. 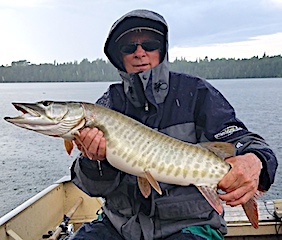 The special story of the day was when Al was fighting a 27-inch Muskie it went completely air born jumping in the boat, unhooked itself and Al just had to measure and release. 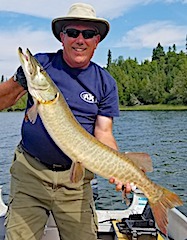 6th and final day was all about finding a 40-inch Northern Pike so Al could get the Master Anglers tri-fecta, catching a Trophy in the Northern Pike, Smallmouth Bass, and Muskie category. They had a productive day but the 40-icnh Northern Pike evaded them until next time. Both left having a fabulous stay already talking about their strategy for 2018. Gary Johnson from Midlothian, IL returned for his second time within a month with Sons Pete & Josh and Steve Trafacanta. 1st day they caught 25 Northern Pike and several Smallmouth Bass. 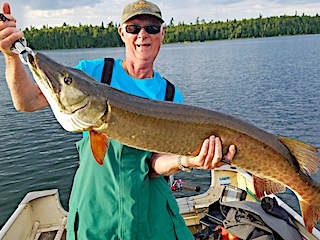 2nd day they ended up catching about 10 fish each with Pete and Steve seeing a HUGE Muskie following their lures. 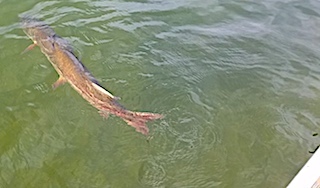 3rd had them catching both Pike and Smallmouth Bass and they saw some very nice Muskie follows. 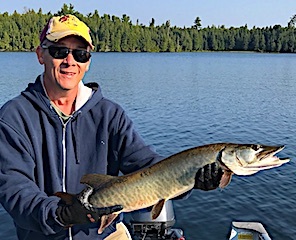 4th day started out a little slow for Gary & Josh catching 3 Northern Pike, but then they started trolling and that triggered a hot bite for Pike. 5th day was very active catching over 50 Northern Pike of substantial size and also seeing some very large fish, one approaching 50+ inches. 6th and final day was all about searching out BIG toothy critters. They again had a number of trophy follows but just could not get them to eat. All went home very pleased with their trip and will be returning for our last open week. Son Matt Holesinger from Roscoe, IL and his parents Don & Audrey from Fulton, IL returned for their 11th consecutive year. DOA the caught 12 Smallmouth Bass and a few Pike. 1st day was incredible catching a total of 94 Smallmouth Bass, Matt with a 19.5-inch Trophy and Don with several Trophy Smallmouth Bass 18 to 18.5-inches plus they had a triple catch and several doubles. 2nd day was good catching 22 Northern Pike and 9 BIG Smallmouth Bass, 5 being 18 to 19.5-inches. 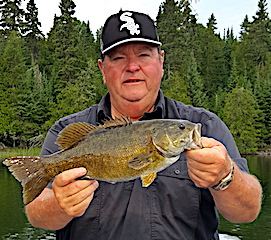 3rd day was back to Smallmouth Bass fishing catching 44 including another two Master Anglers Trophy Smallmouth increasing their total number of Trophy Bass to 13. 4th day had them catching 34 fish being a mix of Smallmouth Bass and Northern Pike and on their 5th and final day the caught 38 Smallmouth Bass and 1 Northern Pike including 2 Trophy Smallmouth Bass making their Trophy total for Smallmouth Bass 15. All three had a wonderful time fishing by day and playing card games by night making another set of wonderful family memories together. Thank very much for choosing Fireside Lodge for spending such valuable family time together. Back for their 8th trip were Dave Henry St Charles, IL and Bob Mezo from Dixon, IL. 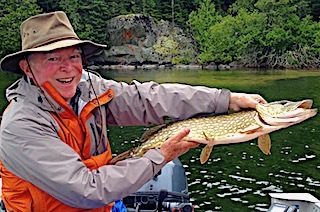 1st day was great Pike fishing catching 63 Northern Pike and they had a wonderful shore lunch. 2nd day was very good catching a Bunch of Smallmouth Bass a Dave caught 4 trophies 2 at 19-inches and 2 at 18-inches. They also caught a lot of Northern Pike in the afternoon. 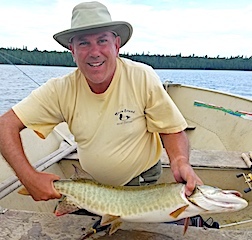 3rd day was a Muskie hunting day doing well catching three, Bob with one and Dave caught two. Both came quickly and left quickly but expressed upon departure on what a great time they had and said in 2018 they will have their regular group of four. Guest since 1995 Paul Frost and his wife Sue from Plymouth, MA were thrilled to be back. DOA they got in just a few hours of fishing catching 11 Smallmouth Bass. 1st day Paul said was terrific catching over 20 Smallmouth Bass and Sue had a fly-fishing experience she never had before catching 11 Smallmouth Bass, but at one time is was such fast action she said she could not get her fly out fast enough to take full advantage of the flurry of activity. 2nd day was great catching 28 Smallmouth Bass, Sue catching 9 fly-fishing and she had a Northern Pike on that bit her off. 3rd day wasn’t their best but had fun catching some Pike and Smallmouth Bass. 4th day they caught about 20 fish total and by the end over the fifth day they caught well over 100 Smallmouth Bass which is the best they have ever done anywhere. Both experienced a wonderful time socializing with the guests at suppertime and afterwards in the lodge. Upon departing they told me they were going to present Fireside Lodge information along with their experiences to their bass club in hopes of creating interest for future fishing trips. Paul & Sue left with wonderful memories going beyond their expectations. Bill & Jill Westbrook from New Philadelphia, OH returned for the 16th consecutive year. DOA they caught good Smallmouth Bass up to a Trophy size measuring 18-inches. 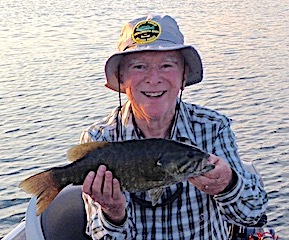 1st day was fun and full of Smallmouth Bass action with Bill alone catching 25 Smallmouth Bass, 4 being Master Anglers Award Trophy Smallmouth Bass. Side story was when Bill was fighting an obviously large Smallmouth Bass, Jill’s hat fell in the water during the netting process and she netted the hat first, placed it back on her head meticulously, and then netted Bill’s Trophy Smallmouth Bass. 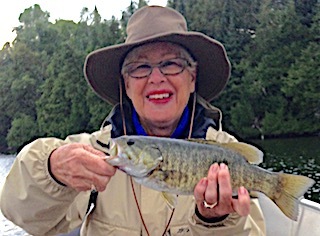 Jill’s theory is that she let Bill have his enjoyment of catching this very large Smallmouth Bass last a bit longer. 2nd day was fabulous catching over 45 Big Smallmouth Bass many 16.5 to 17.5-inches and Bill caught 2 trophy fish at 18 and 19-inches plus Jill got the grand prize landing a HUGE 20-inch Trophy Smallmouth Bass. 3rd day when asked Bill said it was a slow day but then continued to say they caught over 25 Smallmouth Bass. 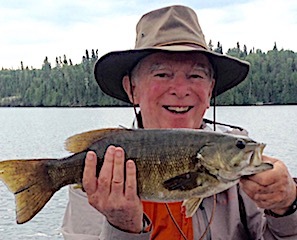 Jill had two at 17.5-inches and Bill caught three Master Anglers Award Trophy Smallmouth Bass over 18-inches. Not bad for a slow day of Fishing at Fireside Lodge. On their 4th and last half day they caught a mix of Northern Pike and Smallmouth Bass landing a few more Trophy Smallmouth Bass ending their trip with a total of 10 Smallmouth Bass over 18-inches topping out at 20-inches. They also met some new Fireside Friends having a great time conversing with other guests in the dinning room. Father Doug Gaddis & two sons Brandon & Trenton from Centerville, IN and Cincinnati, OH were making their first appearance at Fireside Lodge. 1st day was a good day as all caught some nice size Northern Pike while learning the lake. 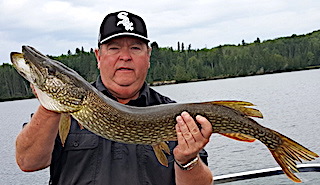 2nd day was full of some fast action fishing catching Northern Pike and Trenton came up with the Big fish of the day landing a 34-inch Northern Pike. 3rd day was spent keeping busy with medium size Northern Pike plus they had an excellent shore lunch. 4th day they did very well catching 22 nice size Northern Pike and lots of action saying they lost as many as they caught qualifying it as they best day they have ever had fishing. 5th and final day they had shore lunch again which was terrific. The fish did not cooperate like the day before but they caught some fish and had an absolutely terrific time making wonderful father & sons memories together. Thanks for choosing Fireside Lodge to do so. First time guests of Fireside Lodge Gary Stueck, son Ethan from Edina, MN, Father-In-Law Roy Myers from St Louis Park, MN and Ethan’s friend Michael McDonald also from Endina were all at Fireside Lodge because of a friends referral. 1st day these four had a blast fishing catching fish, learning a new lake, and just having family fun. 2nd day was fantastic, all catching some nice Northern Pike caught on Lures purchased from our tackle shop plus they had a great shore lunch. 3rd and final day (boy three days goes by quick) they had loads of fun catching Northern Pike and Smallmouth Bass until the rain set in about 1:30 PM. All said they had fabulous fun making many family memories, which will be talked about for years to come. Back for his 19th consecutive year was Walt LaCasse from Wayazata, MN and with him for his 9th consecutive year was his grandson Keeghan. DOA these two did great catching Northern Pike and each landed a Trophy Smallmouth Bass over 18-inches. 1st day was good for 25 fish, 15 Northern Pike and 10 Smallmouth Bass Walt catching another 18.5-inch Trophy Smallmouth Bass but the catch of the day was had by Keeghan while using a new lure, The Swimming Duck, had a Big 34-inch Northern Pike come up and miss the lure then it just sat by the lure for a few seconds before crushing it giving Keeghan a good fight and a great catch. 2nd day they caught about 15 Northern Pike and 12 Smallmouth Bass before supper. 3rd day Keeghan was on fire catching 20 Smallmouth Bass and 20 Northern Pike keeping Walt so busy that he caught only 6 or 7. Keeghan’s magic lure for the day was a Blue Fox Spinner with a pink blade and yellow dots. 4th and final day was a continuation of day 3 with Keeghan keeping the hot had catching most of the fish and landing a MONSTER 19-inch Trophy Smallmouth Bass. Both left having a GREAT time and Walt made reservations for the same dates in 2018 before departing.